It is hard to measure big waves at sea because the waves can smash scientific instruments to bits. 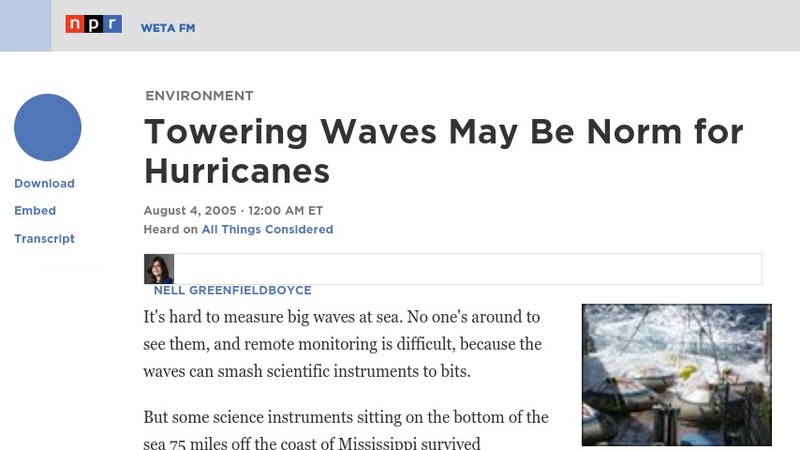 But this radio broadcast reports on sensors sitting on the bottom of the sea 75 miles off the coast of Mississippi that survived Hurricane Ivan in September, 2004 and measured waves over 90 feet high. These are perhaps the tallest, most extreme waves ever recorded with modern instruments. This study suggests that big waves may be the norm for hurricanes rather than freak, rogue events. The clip is 3 minutes and 50 seconds in length.